This 12-year-old polishes nails from a pretty shabby chic caravan in the U.K.
Brooke Dowey isn’t your average 12-year-old. After learning about gel-polish techniques from her mother who is trained on the subject, Dowey began posting her Gelish nail art on Facebook. Her creations garnered mass attention and the appointments came pouring in. Dowey was initially painting in her house in Marske by the Sea, U.K., which wasn’t practical, so she and her mother began the hunt for the perfect caravan. “I really love vintage things from clothing to homeware so I wanted a vintage-looking caravan as a modern one just wouldn’t have the same appeal.” Dowey and her mother spent two to three months on the hunt for the perfect vehicle before settling on the 1970s’ Sprite Cadet. 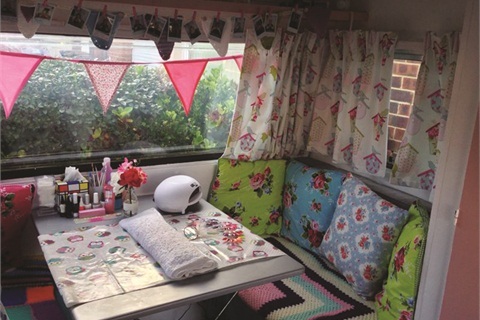 “I wanted to make the caravan feel really cozy, warm, and a pleasant place for people to come and have their nails done,” says Dowey of the caravan’s shabby chic look. The two spray painted the outside of the caravan and filled the interior with vintage items such as crocheted blankets, lace tablecloths, ornaments, and framed pictures on the walls. 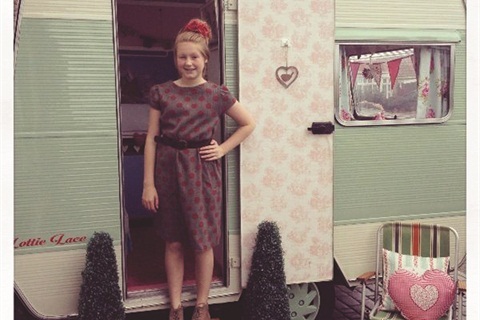 The caravan is affectionately called Lottie Lace, and Dowey’s nail art designs mirror the cute and vintage look.